I have talked about my love of lentils in an earlier post. Like the Swedish are never too far away from a herring, dhal is never too far from my mind. Lentils are comfort food with the benefit of being incredibly good for you. The varieties lend themselves to a wide range of different dishes: Le Puy for a sausage casserole, beluga for a rabbit stew. When my wife asked me to make an Indian version of falafel (as a lower carb snack), I remembered eating something similar at the wonderful Ganapati canteen in Peckham. 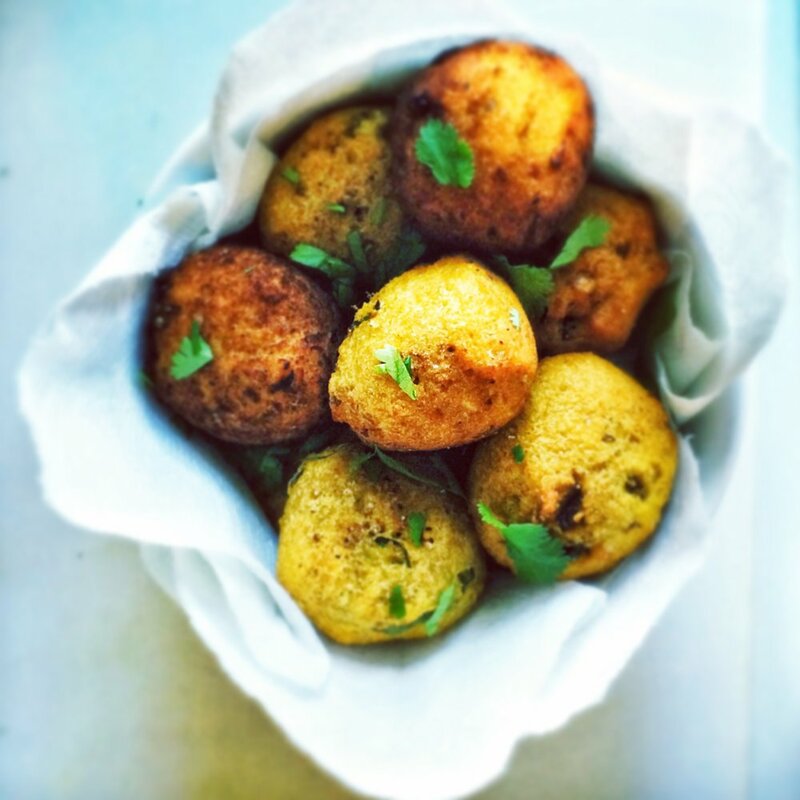 So here is my version of a very popular Indian street snack, perfect for an aperitif or even a small starter. For this dish, I have used split red lentils, but you could replace 50g with chana dhal, which is dried split chickpea. Feel free to adjust the amount of chilli to your taste. I like mine hot. Method: Rinse 100g of the lentils until the water runs clear. Add them to a pan with 350ml cold water, a pinch of salt, the turmeric, curry leaves, cinnamon and peppercorns. Bring to a boil and reduce to a simmer for about 20 minutes, or until soft. Spread out on a tray to dry a little and remove the cinnamon stick and as many of the curry leaves as you can. Meanwhile, grind the remaining lentils to a powder in a spice grinder and mix with the cooked lentils until you get a fairly firm and shapeable mix. Heat vegetable or rapeseed oil to 180c in a deep pan to about 1/3 of the way up. You can tell when it’s hot enough by dropping a little of the mix into the oil and it goes golden brown in about 30 seconds. Using a coffee scoop, shape the mix into balls and cook three or four at a time until golden brown. Remove and place on kitchen towel to dry as you make the rest. Serve with yoghurt mixed with two tablespoons of dried coriander leaves, a few fresh chopped mint leaves, wholegrain mustard and a pinch of chilli powder.